Anna Akhmatova (Russian: А́нна Ахма́това, real name А́нна Андре́евна Горе́нко) (June 23, 1889 (June 11, Old Style) - March 5, 1966) the pen name of Anna Andreevna Gorenko, was the leader and the heart and soul of Saint Petersburg tradition of Russian poetry in the course of the first half of the twentieth century. Akhmatova's work ranges from her short lyric poems from the early, pre-revolution period to universalized, ingeniously structured cycles, such as Requiem (1935-1940), her tragic masterpiece on the Stalinist terror. Her work addresses a range of themes, including time and memory, the fate of creative women, and the difficulties of living and writing in the shadow of Stalinism. Her early lyric poetry is some of the finest written from the period. Her ability to paint a tableau with a few, scattered images was remarkable. Silenced by the Stalin era until 1940, her later poems were tempered by the great personal and national tragedies that befell her during Josef Stalin's era, and about the great poets whose voices were lost. Akhmatova was born in Bolshoy Fontan near Odessa, in the Ukraine. Her childhood does not appear to have been happy; her parents separated in 1905. She was educated in Kiev, Tsarskoe Selo, and later at the Smolny Institute of Saint Petersburg. Anna started writing poetry at the age of 11, inspired by her favorite poets: Jean Racine, Alexander Pushkin, and Evgeny Baratynsky. As her father did not want to see any verses printed under his "respectable" name, she had to adopt the surname of one of her Tatar ancestors as a pseudonym. In 1910, she married the boyish poet Nikolay Gumilyov, who very soon left her to hunt lions in Abyssinia, later known as Ethiopia, the battlefields of the World War I, and finally the society of Parisian grisettes. Her husband didn't take her poems seriously and was shocked when Alexander Blok declared to him that he preferred her poems to his. Their son, Lev Gumilyov, born in 1912, was to become a famous Neo-Eurasianism historian. In 1912, she published her first collection, entitled Evening. It contained brief, psychologically taut pieces which English readers may find distantly reminiscent of Robert Browning and Thomas Hardy. They were acclaimed for their classical diction, telling details, and the skillful use of color. By the time her second collection, the Rosary, appeared in 1914, there were thousands of women composing their poems "after Akhmatova." Her early poems usually picture a man and a woman involved in the most poignant, ambiguous moment of their relationship. Such pieces were much imitated and later parodied by Vladimir Nabokov among others. Akhmatova was prompted to exclaim: "I taught our women how to speak but don't know how to make them silent." 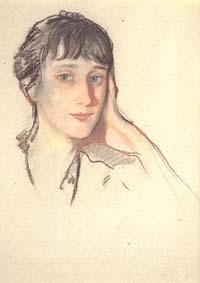 Together with her husband, Akhmatova enjoyed a high reputation in the circle of Acmeist poets. Her aristocratic manners and artistic integrity won her the titles of the "Queen of the Neva" and the "soul of the Silver Age," as the period came to be known in the history of Russian poetry. Many decades later, she would recall this blessed time of her life in the longest of her works, the "Poem Without Hero" (1940–65), inspired by Pushkin's Eugene Onegin. In 1910, Gumilyov fell under the spell of the Symbolist poet and philosopher Vyacheslav Ivanov and absorbed his views on poetry at the evenings held by Ivanov in his celebrated "Turreted House." Anna accompanied him to Ivanov's parties as well. Gumilyov and Akhmatova married on April 25. On September 18, 1912, their child Lev Gumilyov was born. He would become one of the most popular historians in Russia. Dissatisfied with the vague mysticism of Russian Symbolism, then prevalent in the Russian poetry, Gumilyov and Sergei Gorodetsky established the so-called Guild of Poets, which was modeled after medieval guilds of Western Europe. They advocated a view that poetry needs craftsmanship just like architecture needs it. Writing a good poem they compared to building a cathedral. To illustrate their ideals, Gumilyov published two collections, The Pearls in 1910 and the Alien Sky in 1912. It was Osip Mandelshtam, however, who produced the movement's most distinctive and durable monument, the collection of poems entitled Stone (1912). Akkhmatova's books of poems were published in Russian; White Flock (1917); Plantain (1921); Anno Domini MCMXXI was published in 1922. According to the principles of acmeism (as the movement came to be dubbed by art historians), every person, irrespective of his talent, may learn to produce high-quality poems if only he follows the guild's masters, that is, Gumilev and Gorodetsky. Their own model was Theophile Gauthier, and they borrowed much of their basic tenets from the French Parnasse. Such a program, combined with colorful and exotic subject matter of Gumilyov's poems, attracted to the Guild a large number of adolescents. Several major poets, notably Georgy Ivanov and Vladimir Nabokov, passed the school of Gumilyov, albeit informally. Nikolay Gumilyov was executed without trial in 1921 for activities considered anti-Soviet; Akhmatova was married ten years to a prominent Assyriologist, Vladimir Shilejko; and then lived with an art scholar, Nikolay Punin, who died in the Stalinist labor camps. After that, she spurned several proposals from the married poet Boris Pasternak. Her son Lev was imprisoned from 1938 until 1956. As people she knew left, or were taken from her, Anna knew the anguish of Russian women–standing in line outside the walls of prisons, waiting for a glimpse, or a word, with a father, a husband, a lover, or a son. During the whole period from 1925 to 1952, Akhmatova was effectively silenced, unable to publish her poetry. She earned her living by translating Leopardi and publishing some brilliant essays on Pushkin in scholarly periodicals. All of her friends either emigrated or were repressed. Only a few people in the West suspected that she was still alive, when she was allowed to publish a collection of new poems in 1940. During World War II, she witnessed the nightmare of the 900 day Siege of Leningrad, and her patriotic poems found their way to the front pages of the party newspaper, Pravda (Russian for "truth"). Akhmatova returned to Leningrad after the Central Asian evacuation in 1944, but felt disconcerted from "a terrible ghost that pretended to be my city." Upon learning about Isaiah Berlin's visit to Akhmatova in 1946, Andrei Zhdanov, publicly labeled her "half harlot, half nun," and had her poems banned from publication. Zhdanov was a close associate of Stalin, who had led Leningrad during the siege, but was best known as the arbiter of taste, whose policy of Zhdanovism enforced the doctrine of socialist realism in the arts. She was one of the poets that Zhdanov targeted as an example to other writers. Her son Alexander spent his youth in Stalinist gulags, and she even resorted to publishing several poems in praise of Stalin to secure his release, which nevertheless did not come until after Stalin's death and the rehabilitation under Nikita Khrushchev. After Stalin's death, Akhmatova's preeminence among Russian poets was grudgingly conceded even by party officials. Her later pieces, composed in neoclassical rhyming and mood, seem to be the voice of many she had outlived. Her dacha in Komarovo, Saint Petersburg was frequented by Joseph Brodsky and other young poets, who continued Akhmatova's traditions of Saint Petersburg poetry into the twenty-first century. In 1962, the American poet Robert Frost visited her dacha. 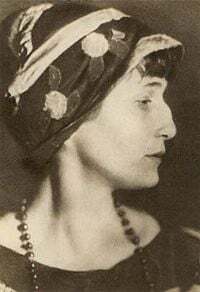 Akhmatova got a chance to meet some of her pre-revolutionary acquaintances in 1965, when she was allowed to travel to Sicily and England, in order to receive the Taormina prize and the honorary doctoral degree from Oxford Universityin the year before her death. She was accompanied by her life-long friend and secretary, Lydia Chukovskaya. Akhmatova's reputation continued to grow after her death, and it was in the year of her centenary that one of the greatest poetic monuments of the twentieth century, Akhmatova's Requiem, was finally published in her homeland. There is a museum devoted to Akhmatova at the Fountain House (more properly known as the Sheremetev Palace) on the Fontanka Embankment, the left bank of the river Neva, which flows through central St. Petersburg, where Akhmatova lived from the mid 1920s until 1952. Hail to thee, o, inconsolate pain! The young grey-eyed king has been yesterday slain. That autumnal evening was stuffy and red. They found him under the old oak's dome. During one night her black hair turned to grey." And went off to work for the night by himself. Like trains — off the railroad. Fate, so black and so untrue." I answered: "I, too, dear one! I, too, will die with you..."
I glanced at the house's dark frame. From the End to the Beginning: a bilingual source of Russian verse. This page was last modified on 23 March 2016, at 15:06.